Ionic channels are key signaling molecules that support electrical communication throughout the body. As such, these channels are a centralfocus of active research as it relates to neuroscience, biomedical engineering, computational biology, biophysics, and drug discovery. This course carefully introduces the quantitative framework (biophysics, stochastics, and mathematical models), optical imaging approaches (FRET), atomic structural methods (molecular modeling, NMR structural determination), and disease linkage strategies (GWAS, high-throughput drug discovery) used to understand ion channel function. 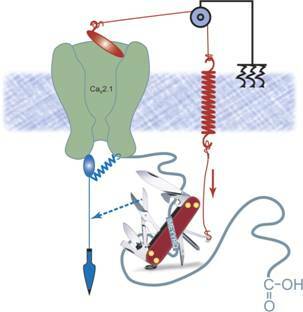 Development of these topics will provide a deep understanding of the interrelation of ionic channels to a broad range of biological and engineering fields. Introductory biology and physics, differential equations, and elementary probability. Ideal for senior BME undergraduates or starting graduate students (BME, Neuroscience, Biophysics, Physiology).